The ecological footprint of the financial sector is mainly determined by its paper and energy consumption. The financial institutions try to reduce this consumption as much as possible. In respect of green mobility they also try to make a contribution. More than in other sectors, the car is banned as a commuting vehicle. For the future, various challenges to reduce the CO2 emissions remain open. 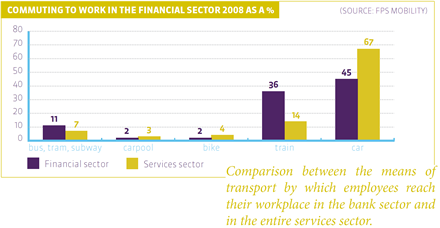 The number of employees that travel to work by tram, train, bus or underground is much higher in the financial sector than in the rest of the services sector. The train is especially frequently used. A strong contributing factor in this regard is probably that each employee is 100% reimbursed for his/her public transport pass(es).. In addition, the headquarters of the largest financial institutions are in the large cities, mainly in Brussels, which are more easily accessible by public transport. This is a development that has become clear especially in the last decade. Before that, a larger proportion of staff was deployed in the regional branches of the financial institutions. Besides a bicycle bonus for those who come to work by bicycle, various financial institutions also provide (covered) bike parking, repair kits and showers. Despite these endeavours to encourage employees to leave the car at home as much as possible, the car nevertheless remains the most popular mode of transport. Nevertheless, the percentage of car users is still much lower in the financial sector than outside of it. The sector is also trying to limit its ecological footprint by promoting “flexible workplaces”. In this system, there are for example 8 workplaces available for 10 employees, or employees can work from home, etc. Moreover, the financial sector promotes electronic payment transactions. 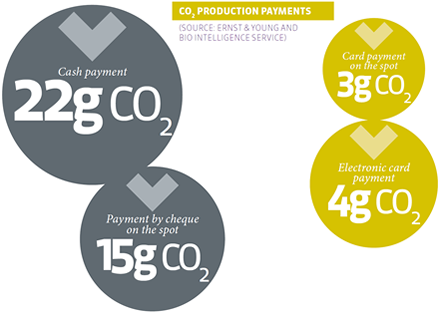 E-payments have the smallest ecological footprint of all means of payment. An electronic payment using a card, for instance, produces 3 grams of CO2, against no less than 22 grams for a cash payment.